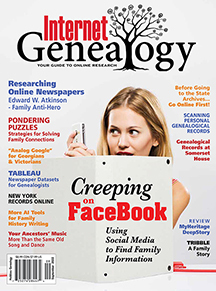 Internet Genealogy is published six times a year and is available by subscription, on newsstands. and as an online magazine on the web. The cover price is $6.95 for single printed copies on the newsstand. To view our current subscription price specials, and to see the other publications that we produce, simply click the USA & Int'l / Canadian link that is located above. The Internet Genealogy FREE app is available through iTunes store. Subscriptions and single issues are available through in-app purchases.